The first issue of The Southern Presbyterian Journal appeared in May of 1942. Dr. L. Nelson Bell, Dr. Henry B. Dendy and a handful of like-minded men had founded the magazine to combat the liberalism that was beginning to influence the Southern Presbyterian Church [the Presbyterian Church in the U.S., or PCUS]. The Journal began in Weaverville, North Carolina, but later moved to Asheville, North Carolina. The magazine continued under the name The Southern Presbyterian Journal until 1959, at which time the name was changed to The Presbyterian Journal. This name change coincided with a change of editors. Henry B. Dendy had originally signed on as editor at Bell’s urging. As he stated at his resignation, “the temporary position stretched out to over seventeen years.” Dendy continued to serve as managing editor and business manager as the post of Editor was handed over to the Rev. G. Aiken Taylor. That change was effective with the October 7, 1959 issue (Vol. 18, No. 23). Taylor was committed to continuing Nelson Bell’s agenda: awakening Southern Presbyterians to the decline of their church. However, Taylor had a different result in mind. He despaired of reforming the PCUS and set about working toward a large, non-regional, conservative Presbyterian denomination. No one was more instrumental in organizing the Presbyterian Church in America, and making it a national denomination, than Aiken Taylor. Ironically, the formation of the PCA—the Journal’s main goal as far as Taylor was concerned—caused the beginning of a long decline in circulation. As more and more Journal readers became PCA members, there was decreasing need for a periodical designed to warn of liberalism in the PCUS. 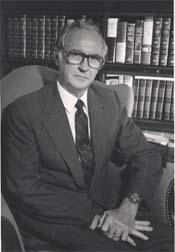 Dr. Taylor left the Journal in 1983 [to serve as president of the Biblical Seminary of Hatfield, PA], and he died shortly after his departure. Dr. William S. Barker became editor, but the Journalcontinued for only a few more years. Its last issue was that of March 18, 1987. 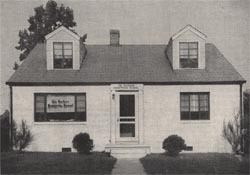 Pictured above right—the original home of the Southern Presbyterian Journal. At left, Dr. G. Aiken Taylor. While Presbyterian newspapers and magazines have rarely been financially viable, there remains a place for denominational and trans-denominational news services. The PCA has byFaith; the OPC has New Horizons; the RPCNA has the RP Witness; and the Associated Reformed Presbyterians have the ARP Magazine. Whether in print or digital format, these services provide a much-needed connectionalism between a denomination’s churches and members. They can make us aware of ministries and opportunities for service, as well as informing our prayers. In short, they strengthen the necessary connections that undergird each denomination. And for this reason, these publications deserve your prayers and support. Subscribe if you can to the print format, and encourage your church to make issues available to its members. Bookmark the web link and visit weekly to stay abreast of the news within your denomination. Better, visit the other links provided above and get to know your brothers and sisters in other denominations. Pray for them too, for they are your brothers and sisters in Christ, engaged with you in this great spiritual battle to proclaim the Gospel and extend God’s kingdom across the whole earth.